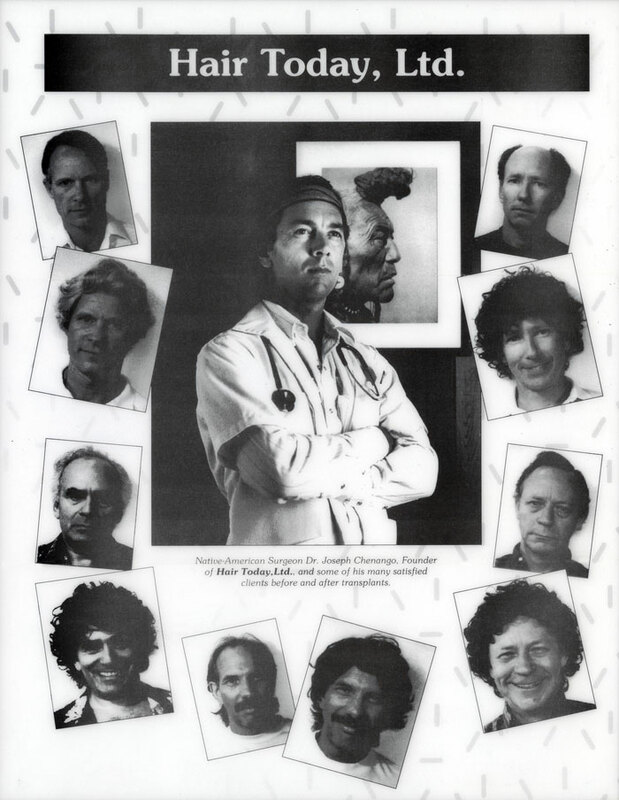 Joey Skaggs > Works > 1990 > Hair Today, Ltd. In the Fall of 1990, Joey Skaggs launched two hoaxes simultaneously. As Dr. Joseph Schlafer, he was marketing Comacocoon, the perfect vacation alternative. 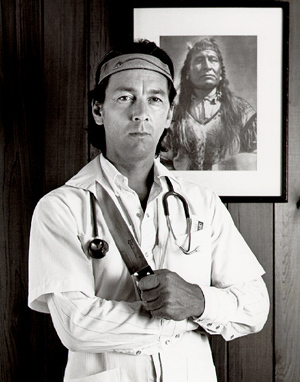 As Dr. Joseph Chenango, a Native American surgeon, he launched a new permanent cure for baldness — scalp transplants from cadavers. He called it Hair Today, Ltd.. Skaggs’ studio at 107 Waverly Place in New York City served as the telephone command post for both hoaxes. Dr. Chenango was soliciting scalp donors with no history of male pattern baldness who worked in high risk occupations, such as electric linesmen or big game hunters. These, he reasoned, would make suitable donors in the event of their untimely death. 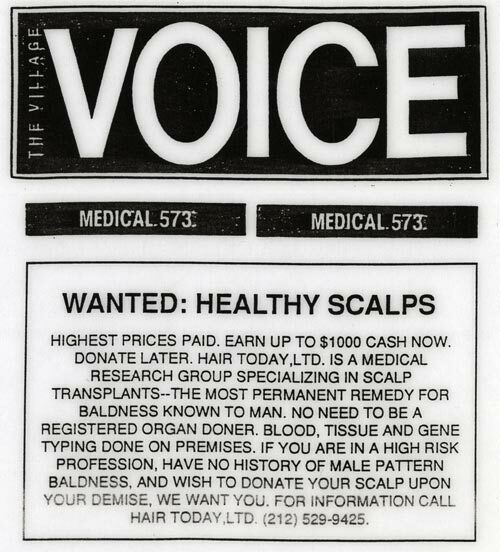 He was also soliciting new scalp recipients–people wanting to undergo a scalp transplant. He promoted his nationwide search with a brochure designed in the venerable style of the ubiquitous, but highly questionable, hair growth companies. He mailed it to 1,500 journalists as if they were potential clients. The brochure had “Before” and “After” photos of satisfied clients, however, there were only three styles of healthy heads, all of which looked like the good doctor’s grandmother’s wigs. Also included was a questionnaire with a diagram for prospective clients to draw in their hair lines. Are you in a high risk profession? Do you have a terminal disease? Do you have any scabs, scars, moles or tattoos on your scalp? Are you currently carrying an organ donor card? At what age did you begin to experience hair loss? Approximately how much money have you spent on hair replacement methods? Do you have any nervous disorders? Are you willing to wait an average of three years for an acceptable donor and for the surgery to take place? Are you willing to put $3,500 into an escrow account while you wait for your donor? Would you be interested in purchasing a franchise of Hair Today, Ltd.? Hundreds of phone calls, letters, and faxes were logged. When the hoax was revealed, there were many very disappointed people.